We've talked before about how strange it is to see animated characters in a realistic style, but this is the first time it's applied to the DC Universe. Thirty years after Bruce Wayne's self-imposed retirement, Gotham City has been overrun by crime and corruption. The former Batman remains in seclusion until high school student Terry McGinnis, fleeing members of a street gang, winds up at his door. Together, they fight off the gang members. Seeing a need for a new hero to watch over his city, Bruce Wayne assumes responsibility for training Terry to become the new Batman! Yes, DC Direct made a Batman Beyond figure a few years ago, but that was in the Superman/Batman "Vengeance" series, and Ed McGuinness' art has never really been what you'd describe as "realistic," so that one doesn't really count. Yes, he was 6" tall, but he was still cartoony. This figure is anything but. Additionally, since DC insisted on calling their BB figure "Tim," this is indisputably the first real version of Terry. For once, the rather disappointing way that Mattel is making the Four Horsemen do the DCU Classics figures has worked out. Yes, Terry's still made from a fully generic body, but since his origins are in the animated world, his costume is meant to be sleek and featureless. The only extra details are the bat spikes on his gloves and the little silver pockets on his utility belt. Sadly, Mattel has chosen to not give Terry his red "cape" wings - yes, they were retractable pieces that only popped out when he needed to fly, but with a hole permanently molded in the spine of every figure, the wings could have been a removable plug-in accessory. As it is, his only real accessory is a silver batarang, done in full silver rather than the red and black seen in the cartoons. 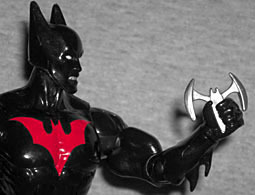 He does hold it well in either hand, though, and that's more than could be said for most Mattel Batarangs. Since Terry's costume is so simple, you probably think the paint doesn't matter. Not so! With such little detail, any error is going to seem that much larger. 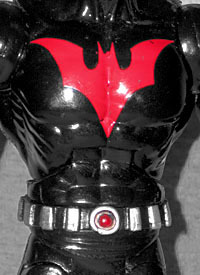 His bat symbol is bright red, his belt is silver with a red dot in the center of the buckle, and his eyes are blank white. On the cartoon, his mouth was a solid white as well, but here he seems to have individual teeth - which has the unintended effect of making his mouth look gray. In any case, really examine all the paint you can before buying a Batman Beyond; it's easy for any of those colors to go awry and throw off the look. Pay special attention to the face. The body of his suit is gloss black, which may sound simple, but remember DCUC3 Nightwing, with his mis-matched mixture of matte and gloss pieces and what a total mess that was. Terry has no surprises in his articulation: everything is the same as it is on all the other versions of this body. The line's chronic assembly problems seem to be tapering off, at last - in that I only had to return one Batman Beyond for a replacement after the joints shearing off. Like Cyborg, Terry has a KB Toys exclusive variant (and, after KB went out of business, an Entertainment Earth exclusive). Unlike Cyborg, however, his variant actually has more to offer, not less. He still comes with the silver batarang, but he's also got a second holdable [a "holdable?" --ed. ], a folded and flattened mask that can be clutched in either hand. The gap in the mask where the mouth goes proves that yes, those were his teeth we could see before. Of course, since holding an extra cowl wouldn't make any sense, the real draw of this variant is that he's unmasked, showing us Terry McGinnis's non-cartoony face and well-coiffed hair. The paint on the forehead of mine is splotchy, but this is still a variant much worth tracking down, if you can; the variant Cyborg was easy to find, right up until the final days of KB, but Terry never was. He has, however, just started showing up at Wal*Mart, of all places! Both Terries (hey, if Bruce never called him Batman, why should we?) come with the same Despero BAF piece: the left arm. What can we say about the left arm we didn't already say about the right? Nothing. So go read that, and know this is nice, but it's nothing until it's plugged into a torso. DCUC4's Batman Beyond figure is really nice. The overall design plays to the strengths of the DCU Classics line (by being very forgiving of its numerous flaws), so he really is one of the best looking DCU figures yet. I wish he had his glider wings, but when that's the only substantial complaint, you know you have a winner. Get the normal one, get the variant... get 'em both, if you can, and you'll have a good new figure to represent one potential future of DC's universe.